Did you know that nearly 80% of Amazon customers use Amazon to discover new products or brands?1 Stores can help with that discovery. Stores is a free, self-service product that allows businesses to design, create, and curate multi-page websites for their brand on Amazon. With Stores, brand owners can showcase their brand story and value proposition alongside their Amazon catalog. This can be a powerful tool to help businesses build their brand and increase sales. Keep reading to see how Stores has helped two brands achieve their goals. 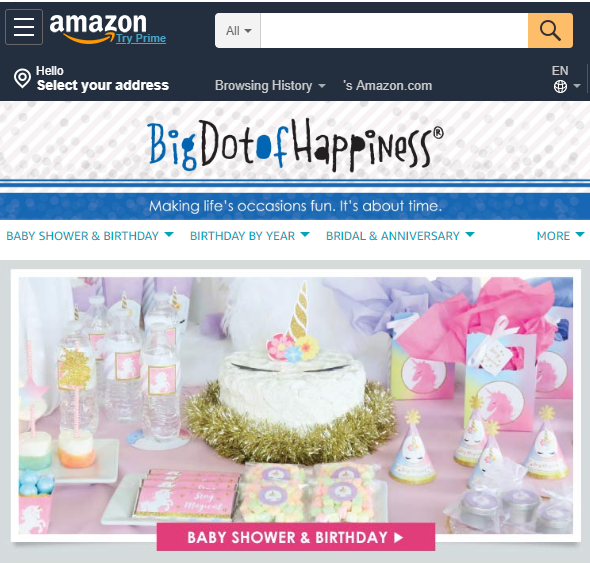 Big Dot of Happiness is a party decoration brand that is all about making life’s occasions fun, offering a wide variety of decorations such as signs, invitations, photo booth kits, and party favorites. The Big Dot of Happiness Store allows the business to present its products in a curated experience. “Our Store allows customers to shop by different occasions and across various decorations for their party. Our Store facilitates product discovery and helps customers find complementary products, leading to baskets with higher order units and sales.” – Sherri Yukel, Founder/President, Big Dot of Happiness. They have seen an increase of 51% in units per order on sales from their Store over regular Amazon sales. Vermont Teddy Bear, builders of handmade teddy bears and other gifts, distinguishes their brand through product quality, design, and craftsmanship. The Vermont Teddy Bear Store showcases the brand’s full selection and features new product launches. They use multimedia content to tell their brand’s story and keyword-targeted ads to reach shoppers with interest and intent who are searching for products like theirs on Amazon. They have seen a 2X return on their advertising spend with this strategy over their off-Amazon campaigns. “Our Store gives our brand a dedicated place on Amazon. Linking our Sponsored Brands campaigns to our Store has increased our ROI” – Jason Baer, VP of Sales & Marketing, Vermont Teddy Bear. These are two examples of how Stores are helping brands tell their story, engage customers, and increase sales on Amazon. If you have not built a free Store yet or refreshed your existing Store recently, visit our site to learn more. 1. CPC Strategy and Survata, “The 2018 Amazon Shopper Behavior Study”, Feb. 2018.